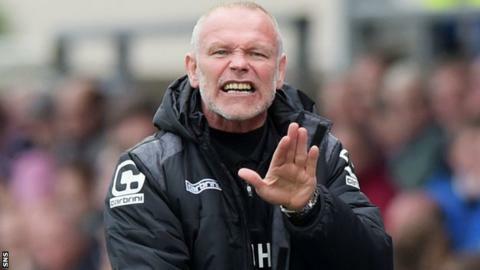 Inverness Caledonian Thistle have rejected an approach from Dundee United for manager John Hughes. United have been searching for a replacement after sacking Jackie McNamara in September. Caley Thistle chairman Kenny Cameron revealed the approach from their Scottish Premiership rivals. "I can confirm that Dundee United have, today, requested permission from the club to open discussions with team manager John Hughes," he said. "The club have stated previously that we wish John to remain with us for this season and beyond. "This position has not changed and the approach from Dundee United has been rejected." Hughes is in the last year of his contract with Inverness, which would limit the amount of compensation required if United prise the 51-year-old away from Caledonian Stadium. United this week decided against pursuing St Johnstone manager Tommy Wright after an approach for the 52-year-old was also rejected. It is understood that United have held discussions with Stuart McCall, who left Rangers this summer, and former United players Mixu Paatelainen and Alan Irvine. Paatelainen, who had been Finland's national head coach for four years until he was sacked in June, has also held discussions with managerless Motherwell. Meanwhile, Irvine has been out of work since being sacked by West Bromwich Albion in December.